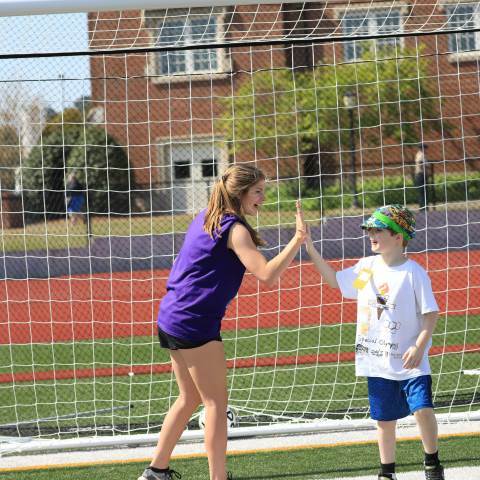 Darlington’s freshman class will partner with Rome-Floyd Parks & Recreation to host the Floyd County Special Olympics on the school’s campus on Thursday, April 18 (note date change). Young athletes numbering 300 and representing Rome City Schools, Floyd County Schools, DIGS, Floyd Training Center, and Network Day Service Center will participate in the annual event. This is the sixth year that the ninth-grade class has hosted the event. The parade lineup will begin at 9:30 a.m. at Darlington’s Chris Hunter ('82) Memorial Stadium, and ceremonies will start at 10 a.m. Participants will compete in running events; softball throw; standing long jump; soccer kick; and wheelchair and assisted walk races. The public is invited to attend and support our local Special Olympics athletes. Nearly 80 Darlington freshmen will volunteer to help with the Special Olympics festivities. They will assist with athletic events, concessions, food preparation and most importantly, they will cheer on the participants. Darlington's Athletic Booster Club will also host lunch for the Special Olympics athletes. For more information or questions about the Floyd County Special Olympics, call Tammy Bryant at 706-234-0383. Special Olympics was founded on the belief that people with intellectual disability can, with proper instruction and encouragement, learn, enjoy and benefit from participation in individual and team sports. The goal of Special Olympics is to help bring all persons with intellectual disability into the larger society under conditions whereby they are accepted, respected and given a chance to become productive citizens. Click here to see a gallery from last year's event.